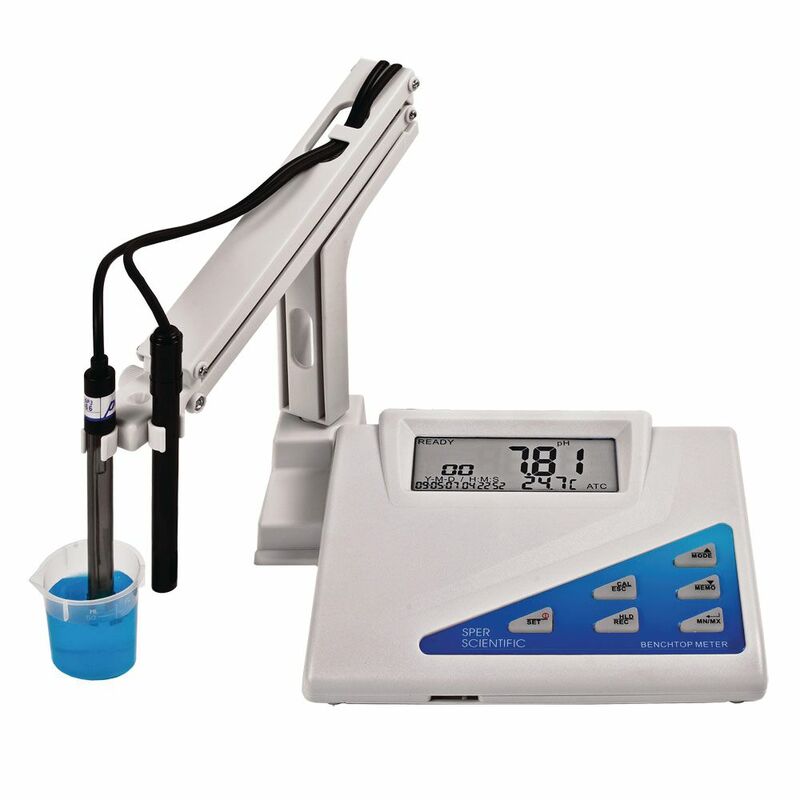 Reads pH, ORP (oxygen reduction potential), mV, conductivity, TDS (total dissolved solids), salinity and temperature. Rugged housing with large LCD displaying the parameter being measured together with time, date and temperature (in °C or °F). Measures: ph, ORP (oxygen reduction potential - SOLD SEPARATELY), mV, Conductivity, TDS (total dissolved solids), Salinity and Temperature. Features: automatic or manual temperature compensation, automatic or manual ranging, automatic buffer recognition, digital and analog outputs, min/max and 99 data points, data hold, 5 calibration points, and electrode status indication. Operates on AC voltage (no batteries). Also accepts any pH or ORP probe with a standard BNC connector. pH Range: 0 - 14. Resolution: 0.01pH. Accuracy: ±0.02pH. Salinity Range: 0 - 11.38, 80 ppt. Resolution: 0.01, 0.1ppt. Accuracy: ±1% fs + 1d. Ordering information: 5-year warranty. Comes ready to use with ATC conductivity and pH electrodes, multiple electrodes holder arm, AC adaptor, computer cable, and software.